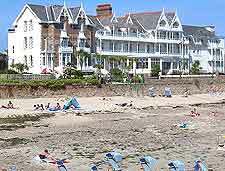 Accommodation on the island of Jersey comes in the form of beachfront hotels, self-catering lodging, holiday lets and various guesthouses. Jersey hotels are at their most expensive in the peak months of June, July, August and September, with room rates being at their cheapest in the winter months. 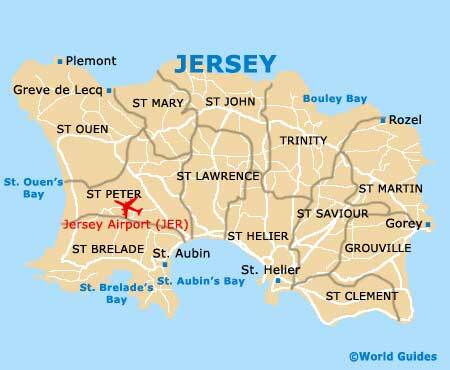 As with hotels, the price for self-catering accommodation on Jersey is also especially cheap right up to March. However, those looking to rent a house or flat at this time of the year will find that some are not available until April, being instead rented out for a six-month period over the winter. St. Helier is where the largest number of Jersey hotels are to be found, usually being conveniently close to the town centre shopping and neighbouring beachfront at St. Aubin's Bay. Over the past 20 years or so, the accommodation and lodging scene in St. Helier has changed dramatically, with many guesthouses and small hotels simply disappearing, being replaced with larger, glitzier versions, such as the £50-million Radisson SAS Hotel, which overlooks the waterfront and Elizabeth Castle. Other popular accommodation options in Jersey's capital of St. Helier include the centrally located Best Western Royal Hotel on David Place, the boutique-style Club Hotel and Spa on Green Street, the recently made over Royal Yacht Hotel on Weighbridge, and the Apollo Hotel on St. Saviour's Road, which is just a stone's throw from the main stretch of shops. 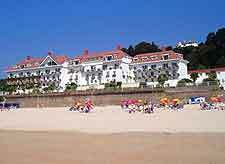 Beachfront accommodation on Jersey is readily available around St. Aubin's Bay, Gorey Beach and at St. Brelade's Bay, where the Beau Rivage Hotel comes highly recommended. 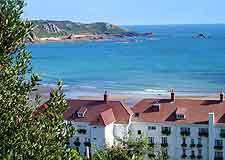 Budget lodging on Jersey consists of a rather magnificent Youth Hostel close to Gorey Beach, on the eastern coast of the island, and a total of four camping sites, with ready erected tents being especially popular at the award-winning Beuvelande Camp Site. For something quite different to hotels, self-catering houses can offer surprisingly good freedom and value, with the Corbiere Radio Tower and St. Ouen's boat-shaped Barge Aground bungalow being two of the most unique.